Does practicing feng shui interfere with your religion? Is it OK to practice feng shui if you are a Christian, for example, or a Muslim? Is feng shui a religion? I have been asked the question about feng shui and religion several times recently, so I thought if several different people asked me the same question within a short amount of time, I must write about it! And, if you are reading this article, you are most probably wondering about it, too, so let's look into it. Is feng shui a religion? Are you going against your own religion if you are applying feng shui in your home or office? Let's go by the definition of religion as "the belief in and worship of a superhuman controlling power, especially a personal God or gods." Feng shui can be defined as "a complex body of knowledge that reveals how to balance the energies of any given space to assure the health and good fortune for people inhabiting it". It sounds easy, but the truth is, feng shui is a very complex ancient art and science with multiple schools, levels of interpretations and, most importantly (in this case) loaded with heavy stereotypes and misunderstandings. While this is probably true for many ancient bodies of knowledge, it seems like it affects feng shui more than let's say yoga, for example (also an ancient body of knowledge). One of the reasons, as I see it, is because feng shui can bring real change really quick, so it has been misused and misinterpreted quite a lot once it reached the Western world. With all the promises of wealth, vibrant health, happy family life and more, feng shui has been heavily exploited and much depleted of its essence. It is approached with either heavy skepticism and ridicule, or a very unhealthy dose of reverence. None of this works, of course, but if I were new to feng shui and were to choose between the two, I would certainly be on the skepticism side rather than the reverent one. So, I certainly understand the concern with treating feng shui as religion. While I cannot say I know of anyone openly praying to a dragon turtle or a Pi Xiu for blessings and protection, I most certainly sense this attitude in many, many people. Plus, of course, there are certain deities in feng shui, such as the Kitchen God, for example, or the 3 Wealth Gods Fuk Luk Sau - in addition to many Buddhist deities such as the Medicine Buddha, Kwan Yin, White Tara, Green Tara, Laughing Buddha - that can create the look and feel of feng shui as religion. It takes a good amount of healthy pragmatism, as well as intelligence, of course, in order to understand feng shui; to take all the cultural stereotypes with a grain of salt, while digging deeper for the meaning and the power of genuine feng shui work. There is a fine line between a belief in a superhuman controlling power (religion) and understanding that everything around us is made of energy, or Chi (feng shui). The line can sure get blurry for people who are new to feng shui. And the variety of deities used as feng shui cures can easily make the lines not just blurry, but sometimes plain invisible! 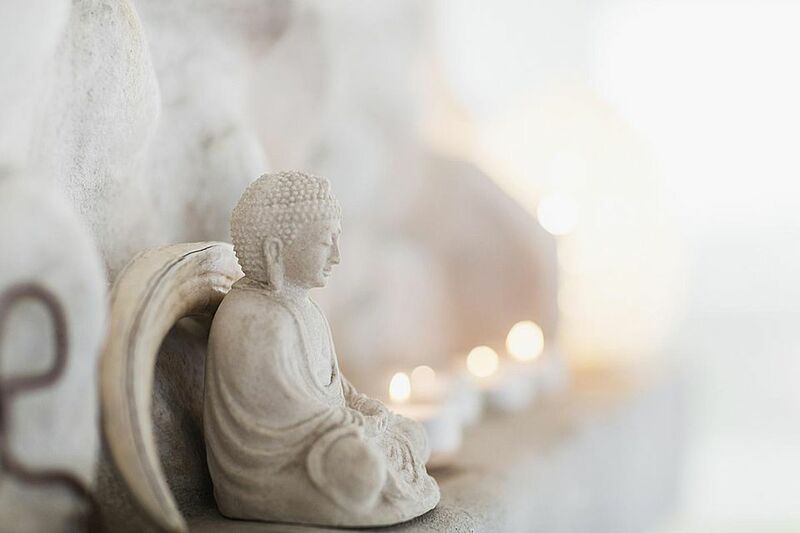 While I can continue for quite a while on the topic of apparent similarities between feng shui and religion, I would rather let you explore the variety of tips here that will help you come with your own answer. Search for "feng shui symbols", "how feng shui started" in our Search box to begin your own journey into feng shui and decide for yourself. To conclude, I do have to say that feng shui is definitely not a religion. Being a deeply spiritual art, though, it sure brings a strong spiritual tone with the presence of a variety of deities, many of them of Buddhist origin. Do you have to use the energy of these deities if you practice a different religion? No, you do not. In fact, it is always best to express the divine energy in the form that is closest to your heart (or suggested by your spiritual tradition of religion). Can you still apply feng shui if you are a religious person? The answer to this question has to be your very own. If you ask me, I will say "Yes, for sure!"